Event planners have to overcome challenges. What were some of yours? This blog is written for and about event planners, and now we want to hear from you. The end of 2014 is approaching – and since fall is one of the busiest times of the year for planners, that probably is a relief to read. Year-end also is an opportune time to reflect and remember. 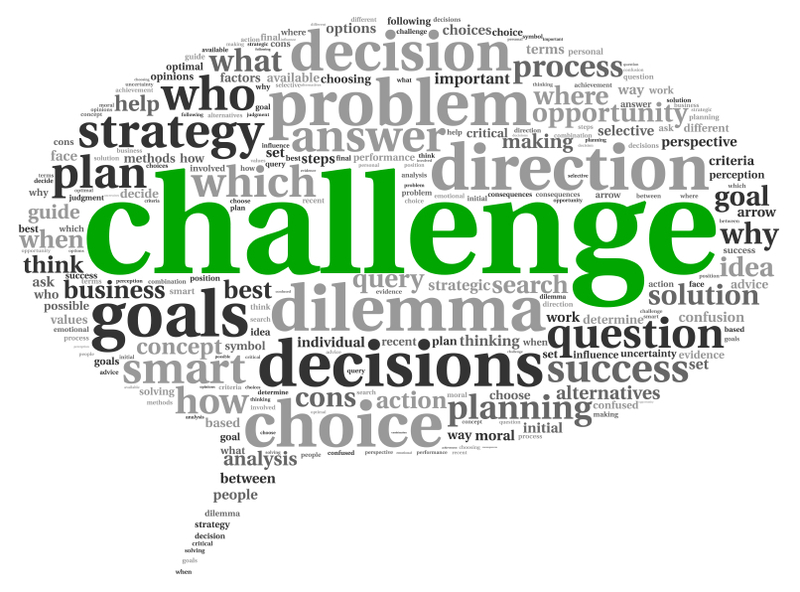 So, we want to know about challenges faced and lessons learned. Please email your submissions to Maria Cornelius of Moxley Carmichael and include your name, organization and a description about the event or circumstances. The assorted anecdotes you send to us will be shared in upcoming blog entries at EventCheck Knox. They can be enlightening, humorous, insightful or all of the above. To get started, some of the staff at Moxley Carmichael shared their experiences when it comes to planning – and executing – events. Amanda Shell Jennings handled two events within the past year at opposite ends of the weather spectrum. The first was the day after Thanksgiving in 2013, during frigid weather. High Ground Park, the historic site of Fort Higley during the Civil War, was to be dedicated on the 150th anniversary of the Battle of Knoxville on Nov. 29, 2013. That meant the date wasn’t moving. The weather, however, was unpredictable at the time of year, and the forecast called for snow and sleet. 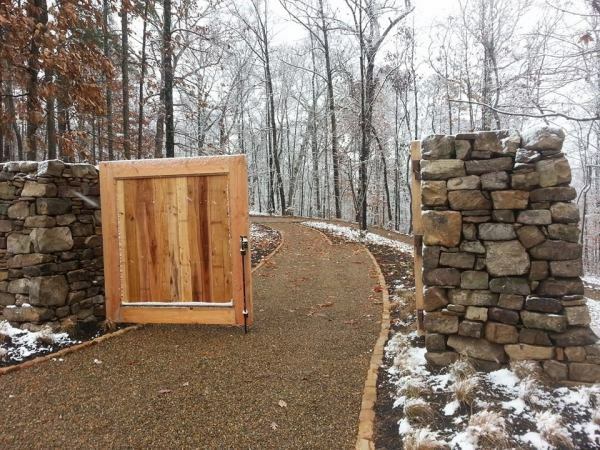 The park is located at the top of Cherokee Trail in South Knoxville – the site overlooks the Tennessee River and offers an expansive view of the University of Tennessee campus and downtown – so a test-run the day before was critical to the success of the event. The day before the High Ground Park dedication, Amanda Shell Jennings was on-site to get ready for any weather issues. Jennings was on the scene Thanksgiving Day during snowfall and sleet to oversee the installation of a large tent for vendors and historians and to make sure the golf carts – needed to ferry attendees to the top of the bluff – would work in the cold and get the necessary traction. Knowing the weather could be dicey in November, Jennings already had ordered portable heaters for the tent and hot cider as part of the refreshments. Jennings noted that when an event has to be held outdoors, there are significant challenges, most of which can be overcome with detailed planning. She also learned that hiking boots are acceptable foot attire when doing a walk-through of a site during snow showers. Fortunately, the weather cooperated the next day. While it definitely was cold, the sun was out, and there wasn’t a trace of snow. The dedication was a resounding success. The sun was a welcome sight the next day when the board of the Aslan Foundation and local elected officials dedicated High Ground Park. 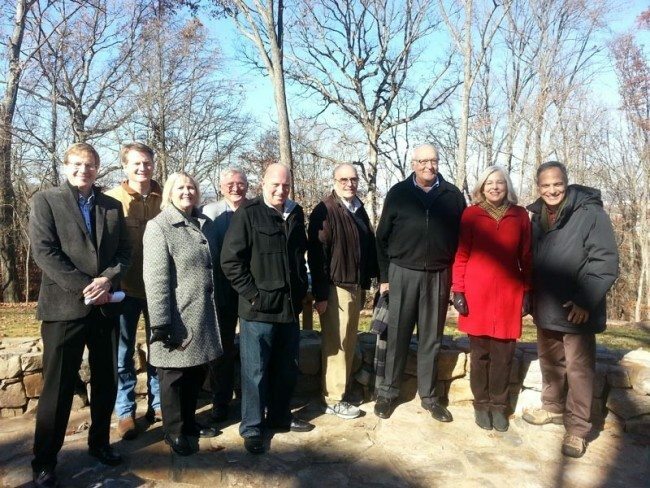 From left, Aslan Foundation Board President Bob Young, Knox County Mayor Tim Burchett, State Sen. Becky Duncan Massey, Knox County Commissioner Mike Brown, Knoxville Vice Mayor Nick Pavlis, Knox County Commissioner Ed Shouse, Aslan Foundation Board Members Jim and Lindsay McDonough and Aslan Foundation Executive Director Jeff Mansour. Jennings dealt with weather of a different kind in late spring for the outdoor welcome reception for Donnie Tyndall, the new Vols basketball coach. It was unseasonably warm for the early June event, coupled with a forecast of heavy rain. Jennings already had a large tent in place, and she had tent sides added to block the rain. The rain, however, held off, and the temperatures didn’t drop, so Jennings quickly had the sides removed to allow air flow and acquired large fans for additional comfort. 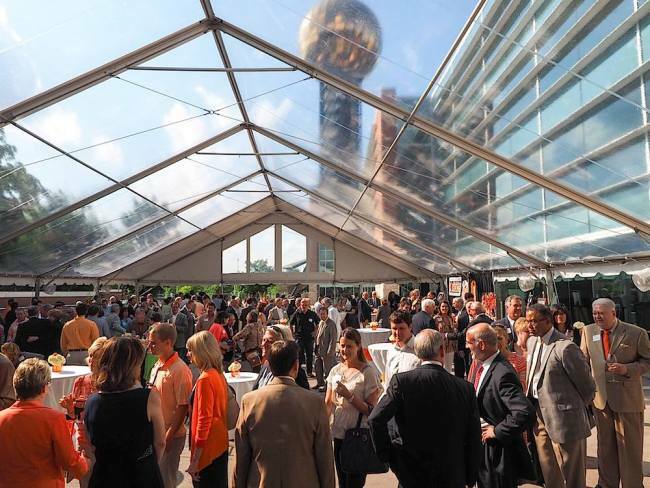 A large tent was in place at the Knoxville Convention Center for the Donnie Tyndall reception. Communication also is critical, and there is no such thing as too much. That rule was in full effect when the East Tennessee health care community held a forum about Ebola last month. The Oct. 21 event was conceived and executed in one week and included multiple parts from assembling a panel and finding a venue to selecting a moderator and securing media advertising and coverage. 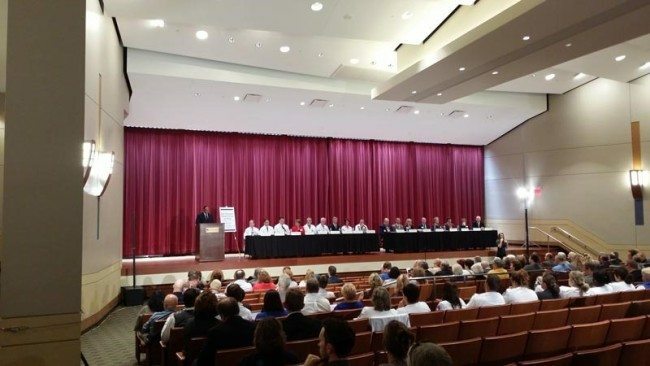 The East Tennessee Health Forum on Ebola featured a moderator and 17 panelists. Constant communication before the event was critical to its success. Natalie Lester, an account executive for Moxley Carmichael, followed that guideline when assisting with U.S. Cellular’s “Better Day” campaign. The event became a better day for children in East Tennessee in conjunction with the Boys & Girls Clubs of East Tennessee when U.S. Cellular held a Tech Day for the youngsters. Lester needed to ensure everyone was kept apprised of the details – and pull off the surprise for the children. 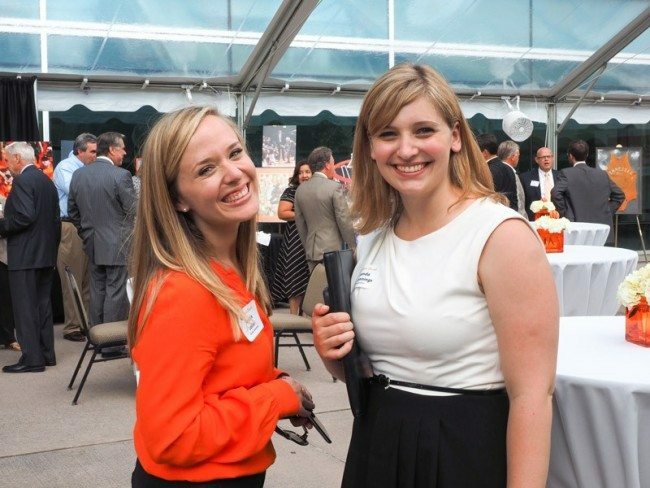 Natalie Lester and Amanda Shell Jennings stay ready to handle any issue at any event. In an earlier blog entry on the site, we wrote about what an event planner needs in a toolbox. Lester and Jennings shared some tips there, too – such as always put balloons in a bag to keep them untangled and consider the wind factor if using draping before unveiling a surprise. So, please let us know about your adventures and lessons in event planning. We look forward to hearing from all of you. Maria Cornelius, a writer/editor for Moxley Carmichael, populates the EventCheck calendar. She is more likely to attend your event if it meets three criteria: cats and dogs present, sports on television and Miller Lite on ice in the vintage bottle.